Archives of Eaton Bray News for October 2017. This article was published in October 2017. Please see Latest News for more recent information. 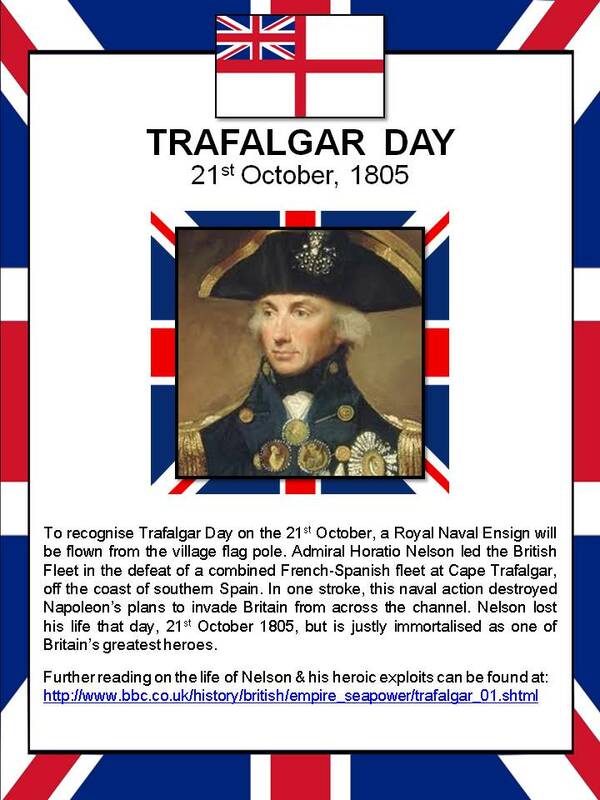 To recognise Trafalgar Day on the 21st October, a Royal Naval Ensign will be flown from the village flag pole. Admiral Horatio Nelson led the British Fleet in the defeat of a combined French-Spanish fleet at Cape Trafalgar, off the coast of southern Spain. In one stroke, this naval action destroyed Napoleon's plans to invade Britain from across the channel. Nelson lost his life that day, 21st October 1805, but is justly immortalised as one of Britain's greatest heros. Central Bedfordshire Council has launched their consultation on school admission arrangements for Community and Voluntary Controlled Schools for the academic year 2019/2020. The results of the recent Eaton Bray Neighbourhood Plan Questionnaire have now been published by the Eaton Bray Neighbourhood Plan Steering Group. You are viewing the October 2017 archive.